His recipe exceeded expectations, so I will include it here in English since his website and video are both in Italian. Making focaccia Genovese is a bit involving, since it requires the dough to raise 4 times and you MUST stick to the given timings, so you must be around it and you can't "leave and forget it". On the other hand, the result is amazing and well worth a try! Put the water, the malt, olive oil, salt and half of the flour into a large bowl. Kneed it well until homogeneous. Completely dissolve the yeast into a bit of water (temperature @ 30C), then pour it into the dough, and kneed until fully incorporated. Then proceed with the rest of the flour and kneed until the dough is smooth and not excessively sticky. Cover the bowl and let the dough rest for about 15 minutes at room temperature (about 30C). Pour some olive oil into an oven tray, place the dough onto it, oil it and change side so that both sides are well covered in oil (with the help of your fingers you can brush the oil all around it). Let the dough rest for 40-60 minutes, and it should have doubled in size by then. 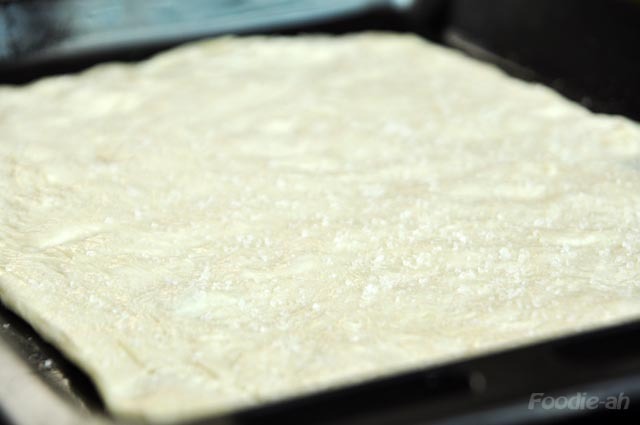 Press the dough with your hands onto the tray, flattening it until it covers the whole tray. You should try not to stretch it in order to maintain a regular thickness throughout. You might find that it's quite elastic and that it needs a little bit of work to stabilise and cover the entire tray. 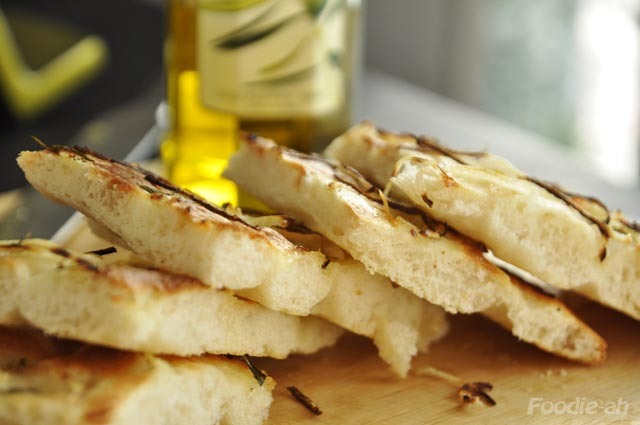 Sprinkle abundant salt on top to give flavour to the focaccia and also to prevent the formation of a dried crust. Let the dough rest a 3rd time, for about 30 minutes. Now it's time to make the classic depressions into the focaccia. 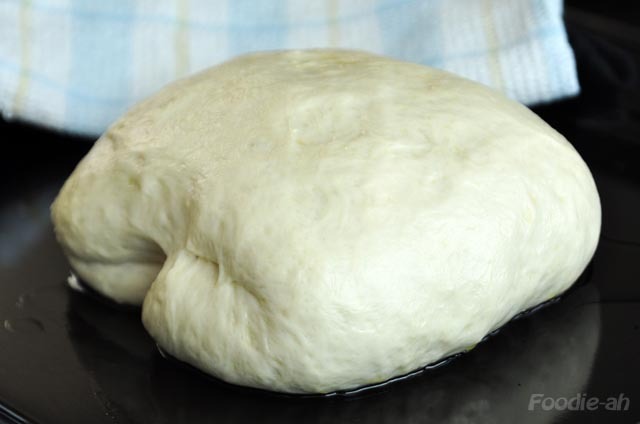 Cover the dough with a few tablespoons of tepid water and some olive oil, then with your palms, massage the liquid on top of the dough to mix it and spread it uniformly. 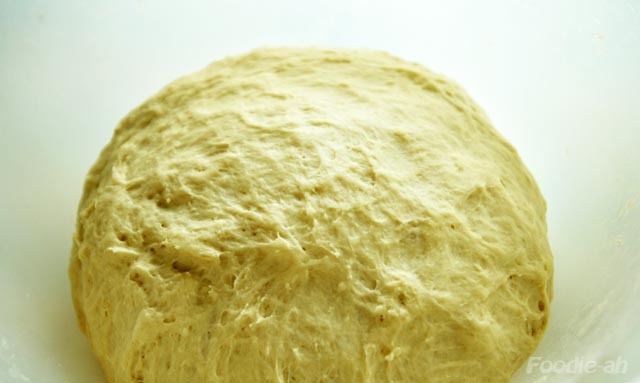 Now, with your fingers push into the dough with energy top to bottom, forming depressions as in the picture above. 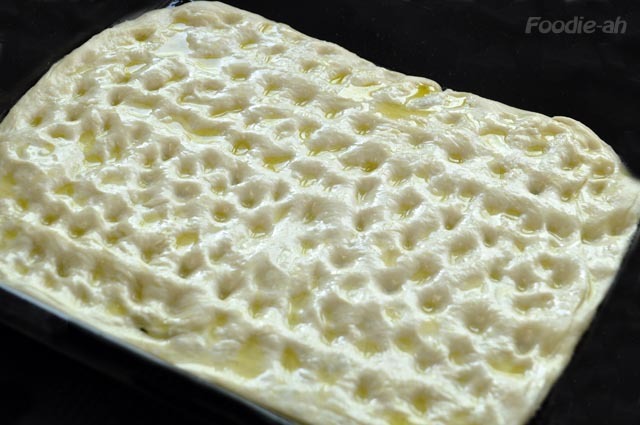 The oil and water should sink into the depressions, forming softer areas that will create the interesting different textures that are typical of focaccia Genovese. At this point you can top your focaccia with your favourite toppings, such as cherry tomatoes, olives, rosemary or onions. In my recipe, I used sliced onions and rosemary. I would make the onion slices about 3-4mm thick to prevent them from burning. 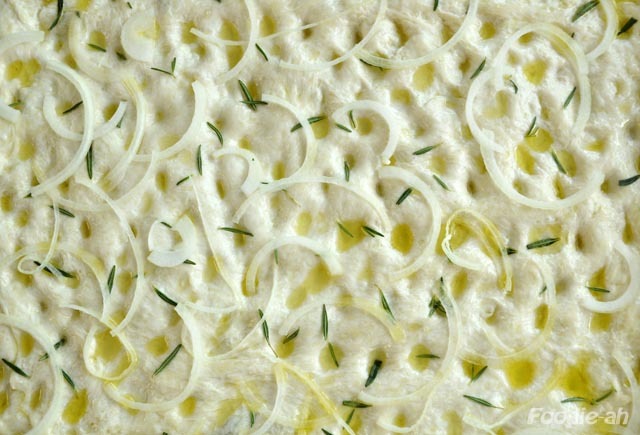 Let the focaccia raise a 4th time, for about 60-75 minutes. Now it's finally ready for cooking. Put the tray into the oven at about 220-240C for 15-20 minutes. 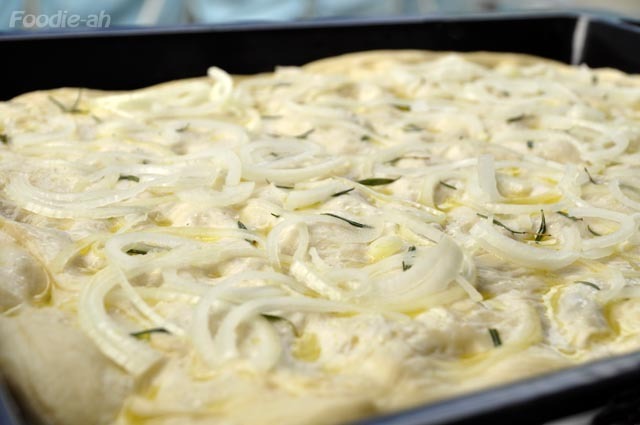 Remove from the oven, lift from the tray and let it slide onto a grate, or any surface that will let the focaccia breathe underneath. This is because if you keep it in close contact with the tray, the steam from underneath will make the base soggy instead of evaporating. 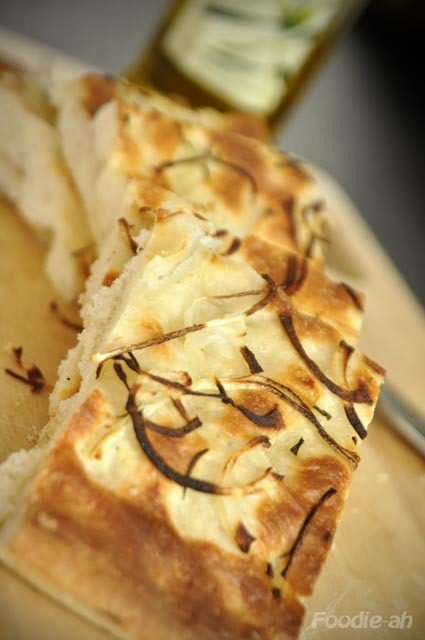 Let the focaccia rest for a couple of minutes, brush with some olive oil on top, slice and serve while still warm. The crust should be salty and crispy, while the inside must be soft and porous. Wonderful stuff - I really enjoy your recipes (made in Singapore with locally available ingredients) and relevant references to boot! And the pictures of course. Now, for the festive season, can you bring the wonderful waft of panettone to these shores? Please? Thanks Pete for all the great compliments! I never tried Panettone, but from what I heard Panettone seems to be a hard one. I have a patissier friend in Singapore who has been trying a few times and still not quite happy with the results. According to him there are several complications with making this in Singapore, but I am not sure whether it's flour or humidity or something else. I have a book with the recipe which is extremely complex, requiring 2-3 separate doughs and professional dough making machines. By the sound of it, not one for DIY home baking :) But they do sell some pretty good Italian brands at Cold Storage! Perhaps I should do a review of those on this blog, or even better a review of the best Pandoro available in Singapore, since I tend to prefer Pandoro to Panettone. Sherie - thanks for the feedback. Unfortunately I don't have a squid ink pasta recipe, but if what you are referring to is something like homemade black tagliolini, you can follow any of my other handmade pasta recipe, except you squeeze 1 or 2 bags of ink from fresh squid into the egg mixture before incorporating the flour. Extracting the ink bag from squid is not difficult, just be careful not to break it in the process. ooOoo...looks so gooz! came across your interesting blog recently. i love bread...will try to make this soon. btw, the malt in the recipe refers to maltose or malt powder? where can i buy this? foodlover - Hopefylly it will be successful! I think it's Malt, but I use honey instead, as any sugar will work to get the yeast activated. Good luck! Hi Amiscell, i finally made this bread today and i must say this is the best foccacia i have ever made! super fluffy inside and crisp and crunchy on the outside! really yummy! i sprinkled some parmesan cheese on top and it turned out even better. will definitely make it again. many thanks for sharing the recipe. 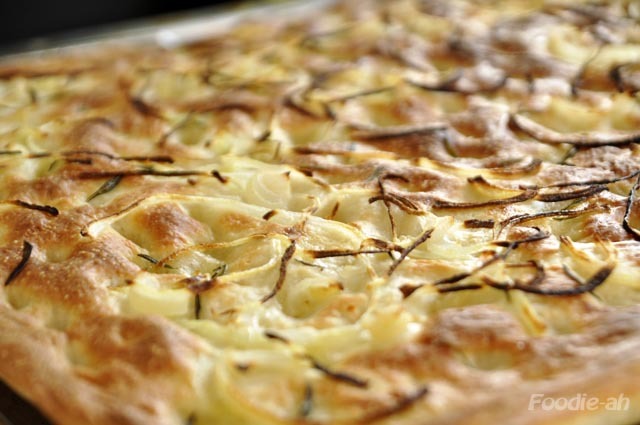 Foodlover - it's exciting to hear that your dream focaccia came true! And it sounds like it turned out as it's supposed to be. Excellent job!